With a little help from Silver River™ Stargazing you can view four of the five bright naked-eye planets in a single night! To the novice, there is little to distinguish one of Earth’s Solar System siblings from the myriad of stars strewn across the night sky. A planet is generally brighter than a star, but both appear as dots to the unaided eye. But if you were to see them up close, stars and planets would be very different. Stars are vast incandescent globes of gas glowing from the heat of thermonuclear fires deep within their cores, whereas planets are typically hundreds of times smaller and only shine by light reflected from the stars that they orbit. Our Sun is actually a fairly typical star. The only reason it’s so bright is that it’s a quarter of a million times closer to us than the nearest we can see at night. Taking our planetary family as an example, the four closest to the Sun-Mercury, Venus, Earth and Mars – are rocky in nature with solid surfaces, whereas those that inhabit the frigid depths of the Solar System – Jupiter, Saturn, Uranus and Neptune – are much larger and largely gaseous in composition, popularly known as the ‘gas giants’. Try as you might, you couldn’t stand on Jupiter or Saturn; you’d just sink into their cloud tops! 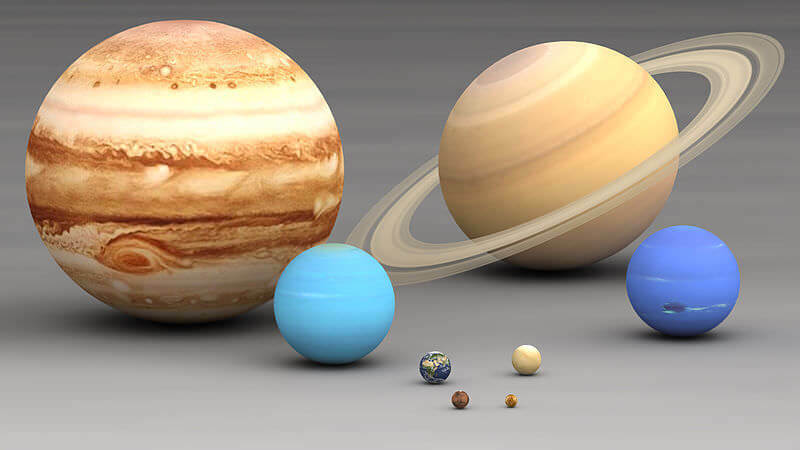 The scale of our Solar System is simply mind-boggling. The smallest planet, Mercury, is little more than a third of Earth’s diameter, whereas Venus is almost a twin in terms of size, while Mars is half our planet’s diameter. Yet the largest, Jupiter, is eleven times the size of our planet and more than a thousand Earth’s could fit inside its vast bulk – and the Sun is ten times the diameter of Jupiter! To find your four planets in a single night you’ll need to find a safe location at dusk close to 1 September, as far removed from the glow of streetlights as you can and allow your eyes at least 15 minutes to become accustomed to the dark. (And no sneaky peeking at your smartphone: you’ll lose your night vision and have to start again!) Ideally, you need to join one of our stargazing tours as we can show you the planets in stunning detail through our powerful telescopes. Failing that, you’ll need a view that encompasses a clear horizon from the west through north to northeast. Our first target is easy and obvious to the naked eye as it’s currently the brightest object in the nighttime sky after the Moon. Venus dazzles a brilliant white low in the west at dusk against the constellation of Virgo where, at the beginning of September, the planet lies close to Spica, Virgo’s brightest star (in binoculars you’ll see the star and Venus in the same field of view). The young crescent Moon passes by Venus on 13 September, the planet reaching maximum brightness on the 24th. As September opens, largest planet Jupiter lies in the constellation of Libra. It’s about ten times fainter than Venus but still brighter than any star. You’ll find Jupiter a little more than the span of an outstretched hand – from the tip of your pinkie to the tip of your thumb – held at arm’s length to the upper right of Venus. The crescent Moon appears close to Jupiter at dusk on 14 September. Commonly called the ‘Jewel of the Solar System’, the ringed planet is a spectacular and unforgettable sight in one of our powerful tour telescopes. 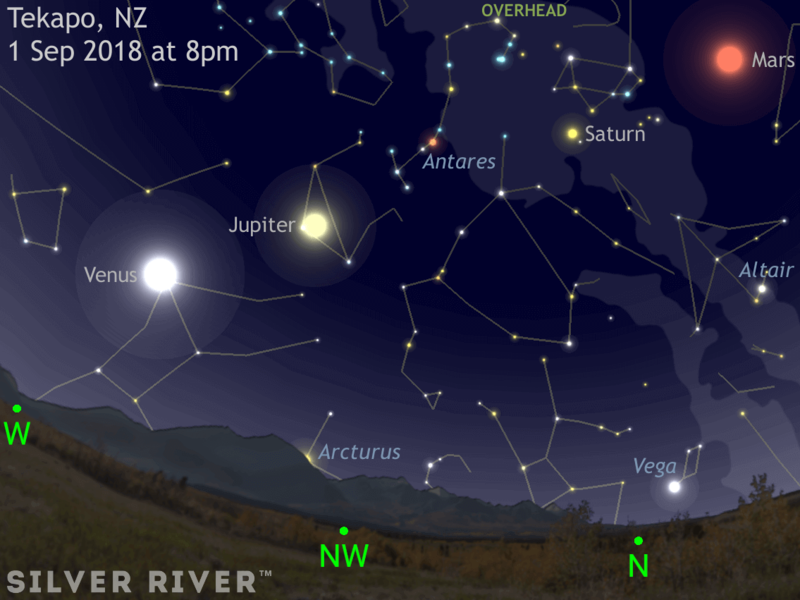 You’ll find Saturn in the constellation of Sagittarius, highest in the sky due north at 8 pm around 1 September, two-thirds of the way from the horizon to overhead in New Zealand. Don’t confuse Saturn with Antares, the brightest star in the constellation of Scorpius one outstretched hand at arm’s length to the left of the ringed planet. Antares has a reddish hue compared to yellowish Saturn, the latter being the brighter of the two. If you’re still in doubt, the Moon is close to the planet on 17 September. Last, but by no means least, it’s the turn of the Red Planet. Mars made its closest approach to our planet for 15 years at the end of July – and it’s still an imposing sight in one of our stargazing tour telescopes. Presently somewhat brighter than Jupiter, you’ll find the unmistakable ochre glow of Mars high in the northeast as darkness falls, a little more than the span of an outstretched hand at arm’s length to the right of Saturn. The Moon lies close to Mars on the evening of 20 September. 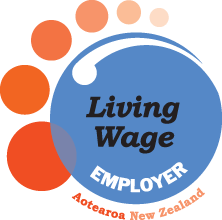 Looking ahead, don’t forget that the Equinox occurs on 23 September marking the start of Southern Hemisphere spring and that daylight saving time (NZDT) starts on the 30th.